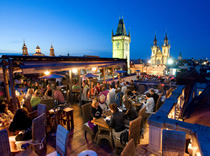 For a romantic and impressive start to a night out in Prague, spend an hour or two sipping cocktails at the U Prince Hotel Roof Terrace Bar & Café at the Old Town Square. The Roof Terrace is situated on the very top of the hotel building, so affords visitors panoramic views over the square and beyond. Once seated, and drink in-hand, look across at eye-level to the Astronomical Clock on the Old Town Hall Tower and at the spires of Tyn Church, while in the other direction Prague Castle appears to float in the distance. And as the sun sets over Prague you will be thinking 'this is life'! The Roof Terrace is open-air and is open all year round, even in the depths of winter; heaters, blankets and covers do a good job of shielding guests from the winter elements. As well as cocktails, the bar serves beers, wines, Prosecco, Champagne, and hot and cold soft drinks. There are also cakes and ice-cream sundaes to choose from; for visitors in the afternoon, coffee and cake is a good option. Prices of drinks are more than for your average bar or café, but not too excessive. Cocktails are priced at around 8 Euros. A bottle of Prosecco costs around 25 Euros. After all, this is no ordinary place. The Roof Terrace Bar is open to the general public, not just hotel guests. To reach it, enter the U Prince Hotel, walk towards the rear, take the lift to the top floor, then walk up a short flight of steps. Sounds intriguing doesn't it!